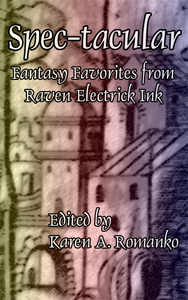 Spec-tacular: Fantasy Favorites from Raven Electrick Ink showcases the fiction and poetry of 26 authors who have imagined the future of sports and games, the past of motion pictures, the alternatives to history, and the myths and legends of Halloween. From sleuthing in the realm of the Pumpkin King, to sailboarding at the universe's edge, from searching for submarine ghosts, to streaming the end of the world, Spec-tacular focuses a speculative lens on our popular preoccupations and pastimes. This selection of editor and reviewer favorites from the sf, fantasy, and horror anthologies Sporty Spec, Cinema Spec, Retro Spec, and Jack-o'-Spec features the work of Paul Abbamondi, J. S. Bangs, Paul L. Bates, Greg Beatty, Robert Borski, Bruce Boston, Sarah Brandel, G. O. Clark, Neil Coghlan, Shannon Connor Winward, Lyn C. A. Gardner, Jude-Marie Green, Samantha Henderson, Michael M. Jones, Deborah P Kolodji, Lisa Morton, E. C. Myers, Gregory L. Norris, Tony Pi, Daniel R. Robichaud II, Brian Rosenberger, Marge Simon, Lee Ann Sontheimer Murphy, Marcie Lynn Tentchoff, Todd Wheeler, and Cliff Winnig. Edited by Karen A. Romanko, Spec-tacular is published by Raven Electrick Ink, publisher of Jack-o'-Spec: Tales of Halloween and Fantasy, Retro Spec: Tales of Fantasy and Nostalgia, Cinema Spec: Tales of Hollywood and Fantasy and Sporty Spec: Games of the Fantastic. 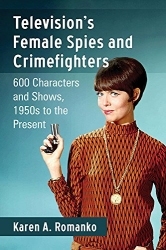 The anthology was released in April 2012 as a Kindle e-book. Tony Pi, "The Shadow-Witch," fiction, Cinema Spec. Cliff Winnig, "The Experiment," fiction, Jack-o'-Spec. Paul Abbamondi, "Art Deco and the Infestation of New America," fiction, Retro Spec. Deborah P Kolodji, "Camera Obscura," poem, Cinema Spec. Paul L. Bates, "Prey," fiction, Sporty Spec. Gregory L. Norris, "The Two Houses," fiction, Jack-o'-Spec. E. C. Myers, "Perpetual Check," fiction, Sporty Spec. J. S. Bangs, "Screening of a Silent Film," fiction, Cinema Spec. Jude-Marie Green, "Hula Hoop," fiction, Retro Spec. Shannon Connor Winward, "All Souls' Day," poem, Jack-o'-Spec. Sarah Brandel, "A Life in Pictures," fiction, Cinema Spec. Brian Rosenberger, "Menace Anyone," poem, Sporty Spec. Samantha Henderson, "Sugar Skulls," fiction, Jack-o'-Spec. Neil Coghlan, "Storm on Fifth Avenue," fiction, Retro Spec. Lisa Morton, "The End," fiction, Cinema Spec. Marcie Lynn Tentchoff, "Star Boarding," poem, Sporty Spec. Robert Borski, "War at the Bijou," fiction, Cinema Spec. G. O. Clark, "Putting off the Past," poem, Retro Spec. Lee Ann Sontheimer Murphy, "Forty-Eight Hours a Year," fiction, Jack-o'-Spec. Lyn C. A. Gardner, "The Mustache," fiction, Retro Spec. Greg Beatty, "eventual, i," poem, Cinema Spec. Todd Wheeler, "Less Than Perfect," fiction, Sporty Spec. Bruce Boston, "beat people," poem, Retro Spec. Daniel R. Robichaud II, "Autumn Jitters," fiction, Jack-o'-Spec. Marge Simon, "The Fix," fiction, Retro Spec. Michael M. Jones, "Who Killed the Pumpkin King?" fiction, Jack-o'-Spec.